Anyone who has facial hair will tell you how important it is to have a good pair of trimmers. But there are a lot of trimmers available that make a lot of promises that they can’t keep, which is why it is important to thoroughly do your research when looking for an electric shaver. If you want a trimmer that can provide you with the ability to leave your face clean shaven or your beard well-groomed, then you’ll definitely want to consider the Panasonic Blue Wet & Dry ER-GB40. The Panasonic Blue Wet & Dry is incredibly lightweight. You won’t have to worry about not being able to maneuver it around your face, as it comes with a nice rubber grip that makes handling it a breeze. And if you like easy, then you will love how easy it is to clean the Panasonic Blue Wet & Dry. Most electrical trimmers are unfortunately not that easy to clean, but the Panasonic Blue Wet & Dry is designed with holes above the blade that allow water to easily stream down and wash away any leftover hairs from the blades. It also completely waterproof and can be used in the shower, which is both convenient and saves time. The Panasonic Blue Wet & Dry can also handle beards that are up to one inch in length, as it has several settings that are perfect for men who have anything from a standard goatee to a full grown beard. The blades themselves are sharp and can last up to three years as long as you treat them right (Panasonic highly recommends you oil them after every shave, but you can probably get away with doing it once a week). They are made of stainless steel and given that the settings can be adjusted from 1MM to 10MM, they should have no problem cutting through most beards. Men who have their facial hair grow in almost overnight have to go through the hassle of shaving every morning, which can be tedious and time consuming. 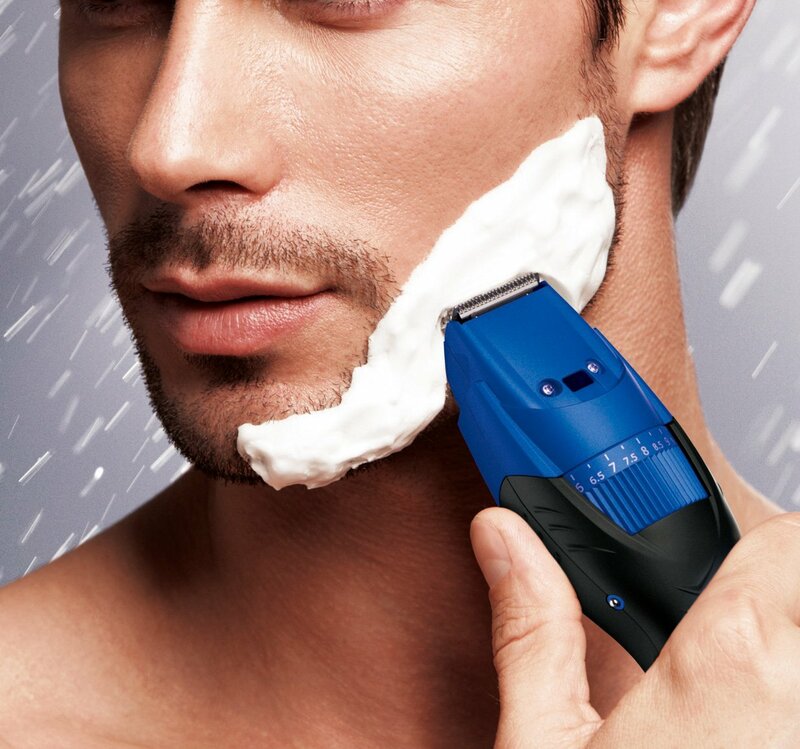 But the Panasonic Blue Wet & Dry is incredibly flexible and can easily shave every inch of your face, including the harder to shave areas around your chin. Last but not least, the battery life. A good electric trimmer can be completely ruined by a poor battery life, but luckily the Panasonic Blue Wet & Dry can last for almost an hour once it is completely charged. This means you can take your time while you attempt to make your facial neat and well-groomed.